New Delhi: Providing telemedicine to inmates by harnessing satellite technology, allowing Chattisgarhi speakers Internet access in their local language and offering farmers the ability to receive tailored cultivation advice by uploading mobile phone photographs online—these are just some of the initiatives that were honoured in New Delhi on 19 December at the Manthan Awards ceremony. Conceived of six years ago by the New Delhi-based Digital Empowerment Foundation (DEF), the awards recognize South Asian projects that are striving to fuel development through digital inclusion across a variety of sectors, such as health, education, business, rural development, environment and culture. This year’s event featured 400 projects from eight South Asian countries, including Sri Lanka, Bangladesh and Afghanistan. “The Manthan Awards is a platform where we aim to inspire people and convince them that technology can change lives," said Osama Manzar, founder of the awards and the DEF. “The main idea is to showcase how communication and IT (information technology) can empower the masses." Among practices and products being showcased at the awards ceremony was a palm-sized audio book player called Buddy. The player, which won an award in the e-inclusion category, was created by the Daisy Forum of India, an umbrella organization of around 80 groups from all over India that aim to make print text accessible to the blind. The Knowledge Help Extension Technology Initiative (Kheti), a project of UK-based Sheffield Hallam University, walked away with an award in the e-enterprise and livelihood category. Kheti offers a mobile phone-based agriculture advice service: Farmers take six photographs of an ailing crop, record a short audio explanation and upload this information to a website where experts offer advice. Explained Haider Rizvi, a Kheti researcher:“Although this software was developed within the context of agriculture, it has the potential to be applied across fields like health and education." The Gramin Radio Inter Networking System (GRINS), was honoured with a juror’s distinction in the m-content category. A product of Gram Vaani Community Media, GRINS aims to facilitate the delivery of services such as agriculture consulting, health consulting and distance education to villages over channels such as the radio, cable television and mobile phones, while bypassing the necessity for satellite technology or expensive Internet bandwidth. The event also witnessed the announcement of a partnership between the DEF and the United Nations Educational, Scientific and Cultural Organization (Unesco), which would offer awards for best rural communication practices among the Manthan nominees. Next on the Manthan agenda is propagation. For one thing, Manzar wants the awards ceremony to take place in countries across South Asia. Sri Lanka, Bangladesh and Nepal are already on board. 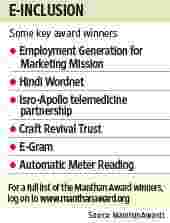 Additionally, Manzar hopes to use the Manthan Awards as a platform to create local content across the country. “We want to use the Manthan Awards network of almost 1,500 projects to establish a DEF community information and resource centre in every state in India," Manzar said. “These can then be used as centres for local content generation created by local people."